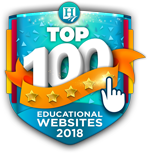 Every year, Homeschool.com publishes our Top 100 Educational Websites. 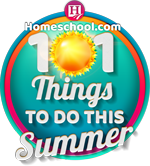 This list is informational, helpful, and a resource homeschoolers look forward to receiving. Hope you enjoy our Top 100 Educational Websites of 2015! Time4Learning Offers Preschool to 12th Grade!! Kidzmet acts as a Learning GPS (Guided by Passions and Strengths) and helps parents have the tools to learn how to speak in their kids’ learning languages. $15/year. 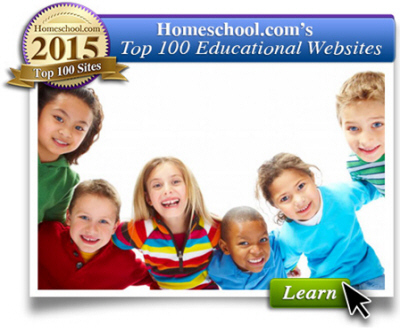 A top ten among Homeschool.com readers—this site provides homeschool reviews of core curricula plus so much more. A guide to Classical education at home. A blog about self-directed, learner-centered education. Learn what unschooling is all about…and get the resources to support it. The first and only flash deal site for educational products. Find new educational products for kids Pre-K through 12th Grade at up to 90% off. In addition, the site offers freebies on a regular basis and homeschoolers can earn EduBucks which can be used towards Educents purchases. Items are delivered online or shipped immediately. A full-service curriculum provider featuring new and used homeschool resources, as well as a large variety of secular and Christian books (fiction and nonfiction). They have almost 30K titles in stock, and almost 16,000 in used titles online. Plus, they offer games, puzzles, CDs and more. 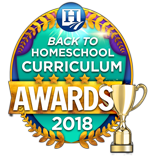 With over 130,000 families, the Homeschool Buyers Co-op is the world’s largest buyers club for homeschoolers, with savings of up to 90% on award-winning homeschool curriculum. Membership is FREE and includes free homeschool ID cards, free SmartPoints (a Co-op currency), and access to our popular databases of homeschool field trips and free curriculum. Stubby Pencil Studio offers a large selection of eco-friendly gifts and creative products for kids, including art materials, school supplies, non-toxic toys, classic games, books, craft projects, party supplies and more. In addition, they offer Earth smart office (homeschool) supplies. Products are long lasting, non-toxic, and responsibly sourced for students of all ages. Affordable and engaging online curriculum for Pre-K to 12th Grade. Interactive lessons, printable worksheets, detailed reporting and MORE. This is a subscription site—$19.95/month for Pre-K to 8th grade and $30/month for their High School Curriculum. To see lesson plans by grade and subject, click here. View a demo before purchase here. The website offers e-learning programs for Grades 3-11 which include video instruction and a teach and re-teach system which helps students learn, progress, and master a subject. You can see a list of homeschool classes here. Homeschool pricing can be found here. Watch…practice…and learn almost anything—for free. This site has videos covering everything from arithmetic to physics, finance, history, and more. This site offers a “complete learning eco-system” for kids K-8, with free and paid for classes in math, reading, writing, language, and more. If you choose the paid version, it’s $99 for 12 months. Animated science, health, technology, math, social studies, arts & music, and English help for kids Pre-K—12th Grade. This is a subscription site and prices start at $130/year. The site’s math and language arts programs offer complete coverage of K-12 content, on the web and through the IXL app (iOS, Android, and Kindle). It is self-paced learning with curriculum that automatically adapts to each student’s skill level, and it provides students with immediate feedback and question-specific explanations. Virtual awards and certificates motivate students, while real-time data tracking keeps parents and students informed of progress. Family memberships start at $9.95/month. These are absolutely free sites. Lessons are available for Pre-K—High School. 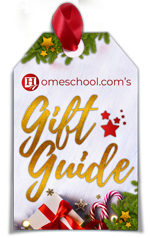 Lesson Planet connects homeschooling parents with high caliber online lesson plans, videos, apps, activities, worksheets, printables, and presentations. The site helps parents find teaching resources quickly and easily. To learn how Lesson Planet helps educators find the resources they need, visit http://vimeo.com/75440364. To browse courses, click on http://www.lessonplanet.com/professional-development/courses. To get a free trial click here. This is a subscription site. Multi-disciplinary lessons/resources that provide connections to the natural world beyond a science and technology scope. Lessons offer curricular benefits in health and physical education, language, mathematics, and the arts. This is a free site. Multisensory homeschool math for Pre-K to Pre-Algebra. Provides proven methods that keep students on track. No lesson preparation required. Kits include free downloads of replacement consumables, and one kit works for the entire family. Visit the site for free diagnostic testing, eBooks, webinars, and their Montessori homeschool math blog. Products range from free-$299 (multi-year kits). Free sample lessons are available. Kungfu Math is an online math practice site filled with motivational game-like quizzes. It is based on the Singapore math curriculum and is suitable for children adopting the Singapore math curriculum or as supplementary learning material for elementary math students. Basic account access is free with premium paid option available (the subscription price is approx. $9.90/month). To view the curriculum, click here. A collection of lessons, calculators, and worksheets created to assist students. Lessons cover key algebra topics. Their equation calculator shows the right answer and a step-by-step solution. Over the years, algebrahelp.com has helped students solve over 15 million equations. This is a free site. ALEKS is an adaptive, online math program that provides personalized learning and assessment for students in grades 3-12. Using research-based artificial intelligence, ALEKS identifies what each student is most ready to learn, and helps students achieve mathematics proficiency through targeted instruction. For a list of courses, click here. For a free trial, click here. Click here for ordering information. Times Tales is a mnemonic-based program that makes it fun and easy to memorize the upper times tables. Times Tales uses simple stories to provide students with a “memory peg”, allowing them to quickly recall otherwise abstract facts. Homeschoolers will be happy to learn that they have a new animated version of their Times Tales DVD. Their products include Times Tales, Memory Trigger, Zone Clean ‘n’ Flip for Kids, Math Bundle Deluxe, and more. This a free web site for students, parents and teachers. It helps with the foundations of all math—addition, subtraction, multiplication and division. Howtosmile.org is a free-access collection of 3,500 of the best hands-on science and math activities for all ages. Based at UC Berkeley’s Lawrence Hall of the Science, SMILE makes STEM fun and educational, and draws activities from leading science centers, science and science education organizations, universities and national agencies. The Exploratorium is located in San Francisco—but this site is of interest to everyone, regardless of location. Topics cover every day science, the earth, the human body, living things – even the science of baseball. This is a free site. Nasa.gov is a great site for students K and above and includes educational programs, Nasa e-clips, podcasts, and MORE. Starchild is geared toward a younger audience interested in learning about “space stuff”. Both sites are offered free of charge. This site offers 3D digital education content of 1000+ Life to Learning (L2L) videos and learning objects for global middle and high school sciences. All the topics are mapped to major global curriculums with multi device experience – desktop, tablet or mobile device. You can view the demo topics here. As students’ progress through animated videos and learning objects, parents can view the data analytics and reports to see what their child knows, and then recommend what the student should study next. Use of their L2L content has resulted in students increasing their test scores on an average of 134% and attention levels by 81%. Complete science curriculum for K-2nd Grade. Over 350 animated activities, printable worksheets and hands-on project ideas. Automated student reports track progress. New iPad app available for student use. This site charges $7.95/month. This site uses an audio-visual technique to teach science (Biology, Chemistry and Physics) in a step-by-step manner. The “right-hemispheric” learning approach takes advantage of the brain’s ability to process images more efficiently and more effectively than just reading text. You can see how the site works and use sample lessons here. Pricing is $79 for one course and $125 for a combination package of any two courses for a one-year subscription. You can also purchase a two-year subscription for $175 for all three courses. You can visit the site and sign-up for current news and offers here. Covers the topics of life, earth, space, chemical, physical science and more. Includes study units, science videos, a science picture of the day and so much more. There are many free items on the site, and a paid subscription is just $30/year. Read Naturally provides supplemental research based reading intervention strategies and materials for struggling readers of all ages. Its strategy combines the methodologies of teacher-modeling, repeated reading and progress monitoring. They also provide programs for reading assessment, phonemic awareness, phonics, vocabulary, and for ELL students. The website offers various sample lessons, best practices, and other resources for teaching reading. A catalog of their products can be seen here. ESA offers a free reading & language program for children in K-6 (ages 4-12). The program supports children with different learning styles and abilities, including those with special needs. Units include sight words, phonics, spelling, grammar, vocabulary, reading comprehension and more. For additional information about ESA, click here. A site geared specifically towards students with Dyslexia and struggling readers. The site offers a structured, multi-sensory reading and spelling program (Nessy Reading). There is a ‘Free play’ area where anyone can try out the program without registering. There is also a free account whereby people can continue to use most of the program for free. For-purchase items start at $30/year and include a reading and spelling program, a touch typing program, a numbers program and additional reading products. Fortuigence offers online middle and high school level writing classes. Their teachers work one on one with students to review student work, give individual feedback, and provide strategies and suggestions for improvement for as long as each student needs until they’re ready to move on. Free resources can be found here and their youtube channel offers free teaching and writing tips. Classes begin at $57. An online reading and writing program for children 4-10 (K-3) that uses a six skill model of reading instruction to teach decoding, spelling and comprehension. There is a 30-day free trial. Subscriptions are available, as are multiple child discounts. There is a scholarship program for those experiencing financial hardship. You can watch a video about the program here: http://goo.gl/UhGdgP . Starfall is a free site that provides a systematic phonics approach in conjunction with phonemic awareness practice for kids Pre-School—2nd Grade. This is a social network and book discovery tool for K-8 students to share their love of reading with friends. Students connect with peers to share book reviews and find their next favorite book through friends’ recommendations or their curated book lists. It’s like Goodreads made just for young readers with teaching tools such as online book reports and reading logs. COPPA Certified to be safe for students under 13. The website includes complete language arts curricula: 4 years of The PHONICS Road to Spelling and Reading (for kids as young as Kindergarten) & 4 years of The LATIN Road to English Grammar (for kids as early as 5th Grade). Click here for detailed scope and sequences, sample videos, and prices. VocabularySpellingCity is a game-based website and app used to build literacy skills with vocabulary and spelling. K-12 children practice their words using 35 fun activities. Use spelling games for free, or upgrade to premium for vocabulary, phonics, writing and language arts. Premium membership costs $29.99/year for up to five children. The website offers the Easy Grammar series Grades 2, 3, 4, 5, 6 and Plus; the Daily GRAMS series Grades 3, 4, 5, 6, 7, and Jr./Sr. High; and the Easy Grammar Ultimate Series (Grades 8, 9, 10, 11, and 12+). All Easy Grammar books include unit reviews, unit tests, cumulative reviews and cumulative tests. Sample pages are available on the site. You can watch videos introducing the different products here. Prices start at $5.00. Language Lizard supports families and educators who teach and raise bilingual children, ages infants to twelve years old. They offer dual-language books and multilingual children’s products in over 40 languages, including Arabic, Chinese, Farsi, French, German, Greek, Gujarati, Haitian-Creole, Hindi, Italian, Japanese, Korean, Nepali, Polish, Portuguese, Russian, Somali, Spanish, Turkish, Urdu, Vietnamese and more. They also offer free multicultural lesson plans that homeschooling parents and teachers can download and use to help teach kids about other languages and cultures. Their blog and newsletters support language learning and multicultural education. Read & craft your way through history with A Book In Time–a one-stop, hands-on history source. The site includes reading suggestions, crafts, projects, games, timelines, and maps-all kinds of extracurricular resources to enrich history in your homeschool. Items on the site are low cost or free, and everything is arranged in chronological order in American and World History categories. Wonderful content, amazing pictures—and who doesn’t like the National Geographic? Plus, it’s a free site. Their courses are specially designed to meet the needs of advanced learners. Their K-12 courses in Mathematics, Language Arts, Science and Computer Programming feature a combination of multimedia instruction and automated assessment of student work to provide students with a personalized, self-paced learning experience. Can choose to work with the support of tutors or work independently. You can see an overview of courses here. Info regarding tuition and financial aid can be found here. Mother Goose Time is a fully aligned, research-based preschool curriculum program which fosters a joy for learning through sensory-based experiences. Their curriculum gives you concrete materials and ideas on how to inspire your child through art, music, logic games and more. All materials included. Additional products include educational toy boxes, assessments, children’s books, and a preschool dance & fitness program. Find themes and prices here. This is an online SAT/ACT program. Students have seen score improvements of 280-590 points on the SAT and 4-8 points on the ACT. To see how TestRocker works: http://vimeo.com/75249634. To take a free diagnostic test and view a customized study plan, visit www.testrocker.com. For a free trial here. This free site offers educational resources available for homeschooling and supplemental education for kids Pre-School through High School and beyond. Subjects include math, science, social studies, English and more. A family-run publishing company that produces Pre-K-Grade 12 Classical Christian education materials for homeschool use. To see their catalog, click here. For additional information regarding their Classical Core Curriculum, click here. Information regarding their online academy can be found here. Egglo Eggs are a fun and educational product for homeschool families, churches and youth groups, as they provide interactive glow-in-the-dark activities for Easter, or anytime. Fun activities include light up scavenger or egg hunts, games, crafts, parties and more. Activity and craft ideas such as the Light of Jesus Scavenger Hunt, are provided on the Egglo Blog. In addition, there are many craft ideas on their Pinterest page and on their Egglo All Year page. Get the Egglo Glow in the Dark Kit here. For the Egglo Curriculum Kit click here. This website offers academic based art projects designed by Mona Brookes, the author of “Drawing with Children”. The on-line store projects help homeschool parents access information on how to add drawing to their curriculum. The projects are user friendly—the homeschool teacher does not have to have an art background to teach these lessons. Product videos and sample lessons are available on the site. This website has a store for purchasing books and lessons. Prices vary. The website provides a constantly expanding curriculum that makes it easy for anyone to teach sophisticated 2-D art to children K-8. Plus, the lessons include suggestions for cross-curricular connections with social studies, science, and language arts. Free art lessons can be found here. Bundled lessons start at $10. Online academy, computerized piano curriculum and lesson plans for early learners, beginners, intermediate and advance students and children with special needs. You can check out their piano learning curriculum before becoming a subscriber. Lessons start at $19 a month for the entire family. Lessons follow a 6-step cycle that makes it easy for students to master the piano. Students have online access and learn at their own pace in the comfort of their own home or wherever they have internet access. No special equipment is needed. You can view the lessons as much as you like on any computer, tablet, or phone. Drum lessons are also available. Click here for drum lesson info. ABCya.com offers free educational computer games and activities for elementary students. Grade level lessons incorporate areas such as math and language arts while introducing basic computer skills. Great array of games including math games, reading games, and games for both kids and parents to play. Picaboo Yearbooks offers high-quality yearbooks at an affordable price, just $9.49 for a 20-page, softcover yearbook, with no minimum order. Their free design tools are easy to use and they offer predesigned layouts and covers making it easy to drag and drop photos into place. All yearbooks include four personalized pages for students to customize with their own photos and stories. Picaboo Yearbooks has Yearbook Support Specialists to help with design and to answer questions, and they have a variety of tutorial videos, a get-started guidebook and other resources to help make the yearbook process an easy one. Plus, all yearbooks come with a digital eYearbook that can be shared electronically with family and friends. Free, easy-to-use online, iPad and iPhone book creator for parents, educators and kids to create their own personalized books in pro-quality print and e-book format. Their exclusive edCenter platform gives homeschool parents a safe and secure environment to collaborate and work with their kids online. Their Young Author Press program helps young authors turn their creative writings into published books with ISBN-13, which allows students to be recognized as published authors worldwide. MetaMoJi Education Solutions include the MetaMoJi Note app (for personal note taking, PDF annotation, and sketching) as well as the collaborative whiteboard app, MetaMoJi Share and the advanced handwriting app known as mazec. These cross-platform apps allow homeschool teachers and their students to teach and learn within a high resolution canvas combined with sophisticated note taking and drawing tools and collaborative learning environments. Innovative features like voice notes and interactive presentations make both products popular for personal and group productivity on Apple, Android and Windows. You can see a video of the product here. Click here to request a demo. The site offers online martial arts courses which include web-based instructional videos, training, monitoring, and an online belt testing program for individuals age 6 (beginner friendly) and older. Students can train on their own schedule, and train anywhere while having access to instructor feedback—it’s the cyber martial arts learning solution. A regionally, nationally and internationally accredited private K-12 online school. This is a NCAA approved curriculum school. Secular and Christian options are available. Full-time and individual courses—all are self-paced. Plus, a wide variety of electives, AP and summer courses are available. Tuition is charged. Click here for an online school demo. An accredited, private online school for students in grades K-12, VSOE offers a wide range of courses including core subject areas, credit recovery classes, electives, religious education, and Advanced Placement classes. Their teachers provide online activities, live collaboration sessions, science labs, projects, service learning, summer internships, fieldtrips, and more. For tuition details, click here. Click here to learn about tuition assistance. Halstrom Academy offers Middle School and High School courses-by-credit to complement homeschooling course work. Choose from AP courses, UC/CSU approved courses, courses in math, science, fine arts and foreign language, summer courses, etc. On campus attendance and full time online options are available. The Middle School catalog can be found here and to see the High School catalog click here. FreedomProject Education is a Judeo-Christian online school that offers a complete Classical education for students in Kindergarten – High School, free of public school and Common Core influence. View FPE’s full list of accredited classes, tuition, and sneak peek videos here. Time4Learning can open doors in a way that other methods can’t—by creating an interactive learning experience that engages kids, brings material to life and makes learning fun! Top Educational Websites of 2015!